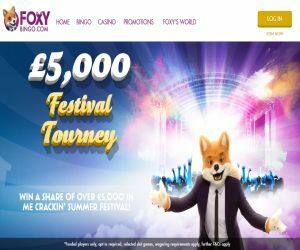 Foxy Bingo's £5K Festival Tourney | Dance & Grab Your Share! This year is literally flying by and festival season has well and truly kicked in! So to celebrate, Foxy Bingo has created his own unmissable festival hotspot for the summer with his £5K Festival Tourney! Are you're more Coachella or Glastonbury? A rock star or a dance diva? A fashion guru or a grunge master? If you're looking for the next festival hot spot, you won't want to miss this! That's because you can still dance through all the festival entertainment, and win your share of £5K, all from the comfort of your own living room! This means you won't have to hunt down the coolest festival outfit, plan your trip, get muddy or even buy a tent! You can also stay warm and dry and ‘shake yer thing' from the comfort of your home! The promotion has begun, but with Foxy's festival line-up, you can still ‘dance your way to the top' until 5th June. To opt in, you simply need to wager £10 on Foxy's selected slots to collect a tourney point. The more you wager, the more tourney points you collect, and the higher you can climb up the festival leader board. The slot headliners include Star Burst, Wolf Run, Jurrasic Juniors and Moon Temple. The board will be refreshed each day If you dance your way to the top 100 players by 23:59 Sunday 5th June, you can win your share of the festival prizes! The 1st place winners can collect £1,000 (cash), the 2nd will scoop £500 (cash), the 3rd can collect £400 (cash) and the rest of the £5,000 will be shared between the 100 winning players!